Provides no really usable information. Looks like they were simply checking a block. App has been in a wasteland for 5 months. Ignored....Walmart not acknowledging app reviewers. If you need a cheap meter and want to manually enter readings and have history stored on meter then go for it. Sharing with Dr or Health Org also broken non-working. Reads 17 points higher than a Nano meter. Save yourself some frustration and ignore BT. Have new iPhone, says paired, will not transfer to Life app. The box says “ReliOn Life Diabetes App” It won’t accept my serial number Please fix! Or fix your boxes to reflect the fact that the compact doesn’t work with the app! This app is sort of broken. The bluetooth syncing will not work unless you eject the used strip with the eject slider - do not pull the strip out of the reader. It will stop syncing from time to time. When it does work the results are not displayed for the current day if done later in the evening. The current calendar day is often one day in the future in the evenings. I think they need to work on the code that controls the calendar/current local day. It may be something with timezones or they are using UTC for some things and localtime for others. If they fixed these two issues it would be great. If the main reason you wanted to get this meter is because of the app, don’t bother. This app is a piece of crap and the meter isn’t much better than crap. It keeps dropping Bluetooth connection. Do yourself a favor, save yourself lots of frustration by just keeping track in a notepad. Just simply not worth the aggravation. Have to jump thru hoops to set it up. Won’t pair with my iPhone. Won’t sync readings. Absolutely worthless. The meter is difficult to set up and sync. The meter only syncs once the strip is removed and the system glitches all the time. The log isn’t kept on the phone or device it syncs to a cloud and if your signal is weak it messes up the meter and device/app sync. There is no way to remove a reading if some one else uses your meter. No way to export or print your log if your health care provider isn’t on the limited select list. App works pretty good but could use improvement. It would be nice if it would sync with the iPhone Health instead of manually having to add it. 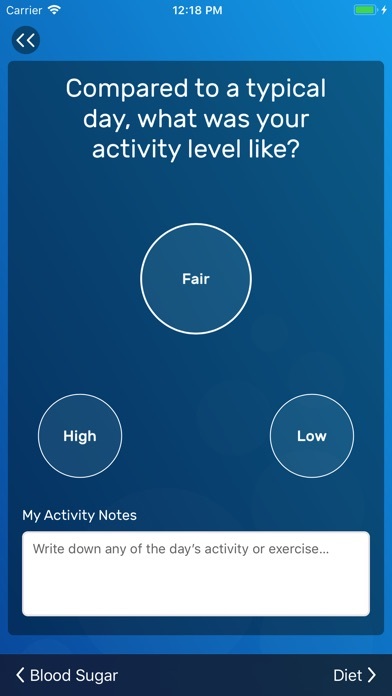 This app has a lot of potential with very useful tools that would help only if the blue tooth would work as it should. The time and date are wrong and the app doesn’t have the option to correct it. Too many bugs not addressed. The day changes the evening before, and I can’t review the current day until after midnight. How is that helping me? If you can’t fix the app, I’ll go buy a different meter and go back to recording my readings in a notebook! I’ve been using this app for a few weeks now and I don’t understand why this app switches to the following day long before midnight. When I take an evening reading I can’t view it because the app is stuck on the next day already!! I like syncing my readings to my phone but there are bugs that need fixing! I couldn’t even get it to connect via Bluetooth and I’m a software engineer. The app is essentially garbage. I see what they envision but the failed to execute. A good update and revision would really help! I want this app to be great! The history is pretty useless. A graph would be helpful, selections of graphs even better. Ie: fasting readings for 30 days I hope to see updates soon! It won’t sync for me so I record on a different app. If I could give no stars I would. My relion premier compact says it is compatible with this app but you will not accept my serial number. Fix it. I have had this meter for a few months now. The meter is ok. However, for folks that buy it to keep track of it on their iPhone. Well you have to log in on it almost every use. It don’t work with apple health app. Meaning none of the information will transfer in the apple health app. Don’t buy this meter if this is what you are trying to do. I give it a 1 star only because I can’t give it a 0. I should not have to give anyone any info on my health for my meter to communicate with my phone. Isn’t that a hippa law? And once I did go through the bs of setting it all up and used it for a week, it logged me out on its own and wouldn’t let me back in until I reset my password. And now I have to input the serial number back in, but it won’t take it, because it is already registered. To me !!! If I didn’t have to log in every friggin time, I would use this app ALOT more. Without the login screen, it could be really useful! This app needs negative stars. They just need to delete this app and just redo it. Just keep it simple and made the app work properly with Bluetooth in one to two steps like all phones do with ear pieces. Make the app based on the meter setup. The app times out after a day, then I had to reenter my user ID and password before the app would sync with my meter. Why doesn’t it remember my user ID and what is the pin for if it doesn’t provide quick access to my meter. First of all, ticked about the ReliOn Micro being discontinued without notice because the amount of blood needed for my cat was way less, but I was thinking Bluetooth tracking would make up for my woes with this monitor. Wrong. This app is complicated for what should be simple. Also now I am locked out because I couldn’t remember my password (my bad) but it continues to say I have the wrong answers to security questions. No I don’t! But even if I did, why did it make me answer a handful of questions if the same two that I can’t seem to type just right (is it case sensitive?) are the only two options it will give me? Essentially I can’t reset my password. To top it off why do I need multiple layers of security just to see random numbers; it’s not like significant amounts of my personal data are being stored here. Let me in!!! Or enable thumbprint or something to make this less annoying. Unable to use the app because it crashes every time I open it. It’s big. No data entry. Food is qualitative entry so so good or poor. No carb counts or insulin info. How ya feelin? Sad? Happy? Stressed out because you wasted $26 on a Bluetooth meter for nuttin? App constantly won’t sync, loses log in information and won’t let me use a pin. I select for it to log in with a pin but the next time I use it I have to completely log in email and password which by the time I enter all this information my meter has timed out. I bought the meter only because of the Bluetooth capability but if the app won’t sync both are useless. App is flakey at best. Not worth using. Too confusing and not user friendly. Bluetooth sync is horrible, could not get my meter to work. First, fix the number of steps to sync. Why do I need to click log entries, click sync meter and once again sync meter. And, on top of it it is no easy to just finish it. You have a couple of more clicks for your mood your activity. Make it simple. One click on the main page and it should sync. Second. Change the history. We want to be able to see the numbers by date so we can see the trend quickly. The calendar view makes no sense at all. Again, I have to click, click, click. On top of it, there is a bug that does not show you the tick mark in a date immediately. You have to click each day to see if you have a reading or not. Just keep it simple. Click once to sync and click history to see a list of values by date and give a trend chart. Get rid of the calendar. It is no use. App will not work anymore. Won’t open. Wish I could give this negative stars! Day switches to the next day on the evening before and you can’t review the day you are actually on until after midnight. 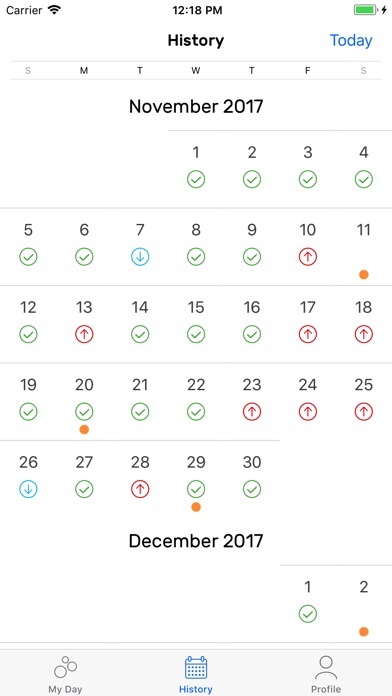 Even when you get all your info done for the day it will show you the orange dot that means you haven’t finished saving your data. Go through and save your entries again, but it will always go back to orange! This app is a major pain and very frustrating!!! Wish I could get my money back on the meter, but as pitifully as they have produced this app, I doubt they care about their customers. It’s just a lot of hype to get you excited about having a Bluetooth meter. But trust me and read all the other low reviews, it will not make your life easier. I do not recommend buying ReliOn’s Premier Blood Glucose Monitoring System. The only reason to buy this meter is for the Bluetooth recording of results. 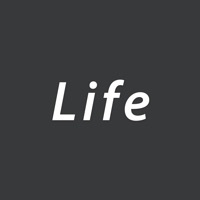 For that to be useful, the app should be easy to use, which ReliOn Life is not. The company doesn’t seem to be interested in improving the design as evidenced by the lack of updates and total disregard for all the feedback provided in these reviews. Although I hate this app, I gave the app 2 stars out of fairness because it works, albeit with difficulty. I did not have the same trouble syncing as other reviewers, but syncing should be much easier. Improvements needed: 1. The app requires that I log in nearly every time I use it. It needs face recognition or at a minimum, a choice to connect without a password. I have twice set a PIN for faster login but it seems to forget that option. 2. The feature for taking a reading should be the first option instead of Motivation. 3. It should take one step to record a reading. It currently requires 3 separate touches—add a reading, sync your meter, sync meter. It’s hard to understand what app developer thought that was a good design. 4. The app should integrate with Apple Health, which inexplicably it does not. 5. The history screen should provide an option to list all previous readings instead of just a calendar interface. I wish the company would pay attention to all the provided feedback and update the app. There are other Bluetooth blood glucose meters with better apps and I’m sorry I didn’t buy one of them. I was very excited to get a Bluetooth meter as I’m tired of manually entering my readings. I am very disappointed. The meter works fine, but the app is almost useless. It doesn’t show averages, estimated A1C or graph your results. These are all features available in other apps. 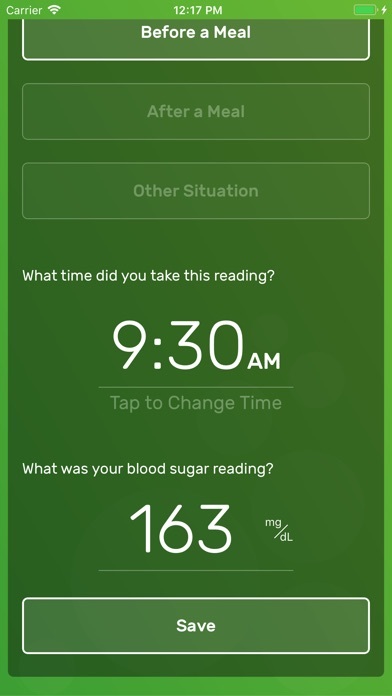 I appreciate all that Walmart does for diabetics and I’ll be anxiously awaiting a new version of this app. The app tells you that it has pulled readings but doesn’t allow you to view them. Very dissatisfied. 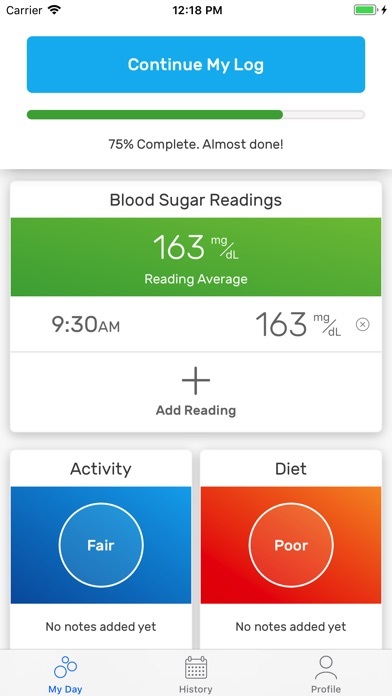 Yes it appears to sync and log my blood sugar readings. I like that it can be shared with my drs office. Fluff is what I call unneeded or wanted features... like the “motivation” that is above the blood sugar reading. Why wouldn’t blood sugar be at the top? That’s the primary use for this app. It needs an option to customize the home screen to remove what the user does want or not use. One needed option for this “life” app would be the ability for entering meds since almost all diabetics take them. Another is blood pressure recording. And of course it should have Apple Health integration. Sadly it does not. I doubt I will keep this app and go back to using Glucosio. Could you please stop worrying about my mood, my diet, my motivation? I just want this stupid app to sync to my device and track my results. Like other reviewers, it shows it synced but I can’t see the info for the day. Since I’m not sure it has my reading, I tried to add it, but this app decided that it is now tomorrow. Please fix this!!! I bought a new device because of the Bluetooth feature only but is useless. Need to manually enter readings. All prior advice is true. And now the app doesn't open!! Great device but developers must align with consumer needs for reliable product support. I was really excited when I saw this in the store and I bought it. As soon as I got home I tried to set it up via Bluetooth but it would not pair. And yes I have location services on. I have the iPhone XR and the iPad Pro and it does not pair on either one. I have various Bluetooth devices that connect no problem. I hope they fix this soon. I have also uninstalled and reinstalled the app still to no avail. Very disappointed. I thought that this app would give me a peace of mind when I take my BG but it just seem to input in the next day. A big hassle. The product I bought clearly says it’s compatible on the box, so I purchased it. The app doesn’t even support the meter I purchased, therefore it’s useless. And why would I want a Bluetooth meter to track my readings when there’s no app to even track them?! Could’ve kept my old meter and saved some $$.